That is the word I would use to describe every aspect of The Palmwood -- a gorgeous, family owned bed and breakfast nestled on a hilltop in the valley of Moloa'a on the island of Kaua'i. I was ecstatic to receive an invitation from Mychael, the manager of The Palmwood, after sharing a super fun surf at Pine Trees a few nights before. His warm welcome and guided tour left me speechless as he pointed out the hand crafted furniture, locally sourced amenities and consciously curated details that make The Palmwood exquisitely unique. Could anything be better than a stay at this tropical paradise? I think not. At the Palmwood, it's not just about providing a place to stay, it's about creating the ultimate authentic, curated, island experience. 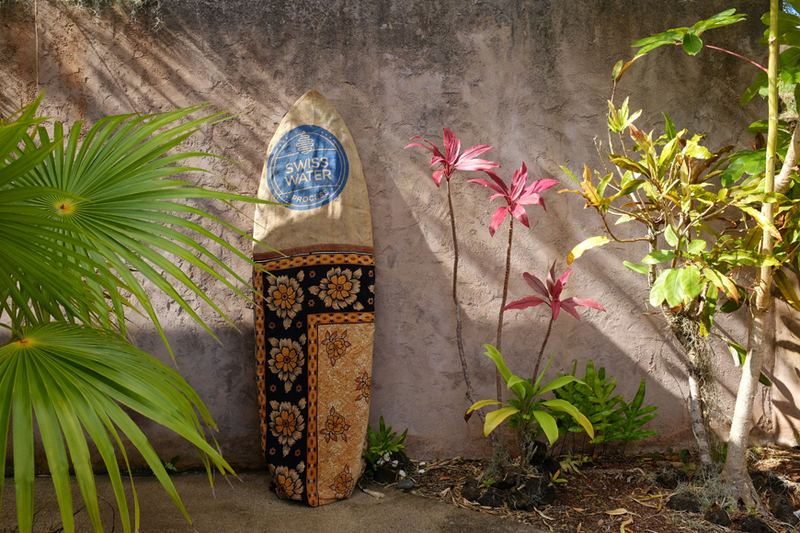 Mychael was not just a warm host who showed me to my room, he was the chef whipping up my tasty vegan breakfast, the travel agent creating my adventure itinerary for the day, my surf guide, as well as my teacher in local storytelling, wisdom and respect. He's not scared to tell you to stay away from a local surf spot or to not share pictures of a sacred Hawaiian hike on Instagram. This kind of authenticity is what I crave when traveling abroad and part of me wishes there was a Palmwood in every corner of the world. It is so important to me to find accommodation that helps immerse me in the community and educate me as a respectful guest. Everything about my time at the Palmwood was aligned with my conscious efforts in travel. I am still dreaming of the fresh local cuisine, rad adventures, and serene sanctuary of this gorgeous homestay.